The next ESRI Meeting will be held next summer in Oxford, UK from 22nd -24th September 2015. 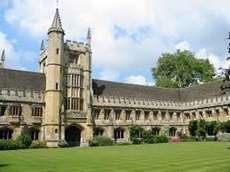 The venue will be the tranquil and beautiful surroundings of Magdalen College. This historic college dates back to 1458 and boasts a medieval dining hall and chapel. Accommodation will be in Magdalen and the nearby Queen’s College. The number of places is strictly limited to 160, so you are advised to book early.